The winter navigation season opens on the Moskva River on November 9. As noted on the site of the Moscow City Hall, the river will launch ten special motor ships, which, if necessary, will accompany the icebreakers. “Thanks to the peculiarities of the construction, they (ships) can sail along a river covered with a thin layer of ice and even chop ice up to 20 centimeters thick. In the case when the thickness of the ice exceeds 20 centimeters, the ships go on a voyage accompanied by icebreakers or in advance trampled tracks. 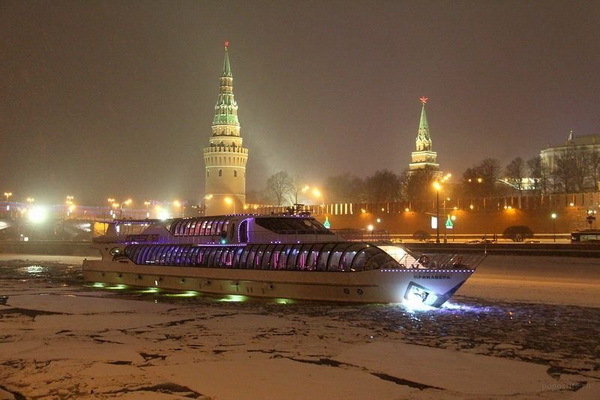 From November to April, 10 such passenger ships will run around the Moscow River, “the website reported. The ships will depart at 11:00 from the berth Hotel Ukraine on the quay of Taras Shevchenko. Pleasure boats will also depart from the Gorky Park berth. A river excursion, during which you can see the park “Vorobyovy Gory”, the stadium “Luzhniki”, the Kremlin, the park “Zaryadye” and the Cathedral of St. Basil, lasts two and a half hours.